I am new to Muggle net, and am very glad to be part of this group. As many of you may know ABC Family will be airing Harry Potter films beginning tonight at 7.30pm (EST). I have seen ABC Family's version of the Sorcerer's Stone and I wanted to invite you all to watch it. This version as approx. 30 mins of film not on the DVD. There is a scene of Dudley in his Smelting uniform, Aunt P. cracking open eggs with Harry's letter's in them, Harry and Hagrid on the train to London ect. Many of these additional scenes are important to the movie, and some are just Fun. If you have Time please check it out I would love to talk about the differences in this version to the DVD. The Sorcerer's Stone will air on Saturday @ 12.30pm (EST) as well. It is actually seven minutes of new footage, the full half hour is mostly commercials. I've seen the extended ABC Family cut and it was great, even better than the original. In case you didn't know this Tuesday the "Ultimate Cuts" are being released on DVD/blu-ray and they contain these extended cuts plus loads of extras (for both films 1 and 2). You beat me to it, CrazyMuggle. I'm looking forward to those Ultimate editions. Funny thing is, I was just saying how 'tis the season for Harry Potter to be airing on TV again! Good catch. Crappy thing is, I have to work all day Saturday (OT) . Bummer. I need the christmas money though. I too will miss Friday's showing of the Sorcerer's Stone, because I am at school during that time. And, I thought that OoTP will be shown also this weekend. Oh, I had no idea about this. New footage not seen even in the deleted scenes coming in the DVDs? Is that the Chris Columbus movie?. I am very glad about this. Sounds like a mega extended DVDs/ Blue Rays coming in the future. I don´t know if it exist now. Ultimate Film Collection Editions?? I watched the 'Harry Potter Weekend' thing that ABC Family was doing.. I ended up watching Sorcerer's Stone Friday, Saturday, and Sunday! Haha. It was amazing, though. Does anyone know when they'll be adding Order of the Phoenix to their Harry Potter lineup? In case you didn't know this Tuesday the "Ultimate Cuts" are being released on DVD/blu-ray and they contain these extended cuts plus loads of extras (for both films 1 and 2). I like it when they add the deleted scenes on tv. The extra scenes really add to the movie. Although, I missed half of GOF on Sunday night and when I tuned in, the were playing an extended scene! I was bummed because I didn't know if I missed any other deleted scenes for GOF! And are the dvd versions of the Ultimate releases of SS and COS gonna be the same as blu-ray, or is it going to be one of those things where you get a bit more on the blu-ray than you do on the dvd? Yes! They finally extended GOF! (Gof has been running on ABC family since summer 2008 but not extended). I was pleasantly surprised and elated last night when the school suddenly erupted into the Hogwarts song! Every single deleted scene on the DVD except for the extended Yule Ball Weird Sisters rock song/mosh pit scene, were edited fairly seamlessly into the movie proper. The deleted scenes make GOF a better movie, IMO, like the deleted scenes from COS make that movie better! You get a stronger sense that Voldemort is coming back, and it also embellishes Snape's backstory and character a little more which connects nicely to HBP. Last edited by MasterOfDeath; December 7th, 2009 at 9:17 pm. Yes! They finally extended GOF! (Gof has been running on ABC family since summer 2008 but not extended). I was pleasantly surprised and elated last night when the school suddenly erupted into the Hogwarts song! Every single deleted scene on the DVD except for the extended Yule Ball Weird Sisters rock song/mosh pit scene, fairly seamlessly into the movie proper. The deleted scenes make GOF a better movie, IMO, like the deleted scenes from COS make that movie better! You get a stronger sense that Voldemort is coming back, and it also embellishes Snape's backstory and character a little more which connects nicely to HBP. Last edited by lcbaseball22; December 7th, 2009 at 9:23 pm. I think the most important deleted scene that was added back in was when Harry, Ron, and Hermione were talking about the death of Crouch. When I first saw the movie, I was like "Why did Harry just prance up to Dumbledore's office and not say a word about Crouch?" Then I realized that you can hear Dumbledore say "a man has died". I could hardly hear it! Having the scene back really helps the movie. You hear Ron specifically mention Crouch is dead, and Hermione says you should go to Dumbledore, so it makes sense why he randomly goes there. Oh, and yes, I am glad too the extended Yule Ball scene was not put in. It would have made the movie WAY to draggy. Okay. Thanks! Have been thinking of going Blu-Ray, but can't quite decide. I thought the same thing on that scene! It really helped to bridge the other two scenes together! But I also noticed that they cut part of the scene when Snape is talking to Harry about slipping Veritaserum into his juice. The cut the part where Snape tells Harry that he knows they're brewing Polyjuice potion and he's gonna find out why. They had Snape slamming the door in Harry's face right after he says "boomslang skin? Lacewing flies?" It just seemed rather odd. Last edited by katana; December 8th, 2009 at 12:03 am. But I also noticed that they cut part of the scene when Snape is talking to Harry about slipping Veritaserum into his juice. The cut the part where Snape tells Harry that he knows they're brewing Polyjuice potion and he's gonna find out why. They had Snape slamming the door in Harry's face right after he says "boomslang skin? Lacewing flies?" I just seemed rather odd. Hmmm... didn't notice, I'll check again (DVR FTW!). Hopefully it will be restored in the Ultimate Collector's Edition. So did anyone notice if in PoA they added back in the scenes when Sirius went to kill Scabbers? I wasn't home when it was on, and I have not seen the extended edition in its entirety. Yes, they did! I noticed that too. It's because the next scene is the deleted scene where Hermione pieces together that Snape thinks they are brewing polyjuice potion. If they kept Snape's last line, it would have been redundant. I too loved that trio common room scene. I think it's become my favorite of all the deleted scenes for GOF. It feels like the book for some reason...Ron is actually knowledgeable and smart. He mentions how the Ministry will cover it up setting up the ministry plot in OOTP. Hermione says how surviving the tournament isn't the answer anymore, that it's bigger than that and enumerates all the strange events that have been happening which builds up the atosmphere of the return of Voldemort. I did enjoy the ABC versions (me and my sister watched all the HP movies they played for all three nights ) - because it included the extra footage which I enjoyed because the movies (especially in SS and CoS) included deleted scenes that did come from the books, and made the first 2 movies feel as if they were best of the films; the first 2 movies stayed true to the first two books IMO - PoA is a close second. The only two deleted scenes I noticed were an extended sequence with a blue bird (where Hagrid tries to smack it between his hands) and Sir Cadagon not allowing the Gryffindors passage into the Common Room. 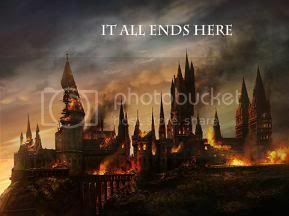 There was no McGonagall (I don't think they can re-insert that scene without the Sirius/scabbers attack). Harry Potter Weekened on ABC Family THIS Weekend! These are both the extended editions, so set your TiVo's and DVR's now. It is a shame they are not showing the first two. ABC Family also has the rights for OotP, so we should see it in the near future. Other 2007 movies like Spider Man 3 and Pirates of the Caribbean: At World's End all debuted in 2009 so we should see it on ABC Family soon. Last edited by Jack5555; January 8th, 2010 at 4:59 pm.